Here’s a quick list of the gear I use most actively. A more detailed discussion follows the list. There is no one-size-fits-all when it comes to your choice of camera. These days, even a simple point-and-shoot camera or a smartphone camera is capable of making very good images. But if you’re willing to carry a bit more weight and to learn how to use it before you take it on your first trip, a mirrorless interchangeable lens camera or a digital single-lens reflex (DSLR) camera will give you much more flexibility. I use a DSLR, but more and more of my photographer friends are switching over to mirrorless cameras. It’s really a matter of personal choice, and if you’re not planning to carry a lot of specialized (and heavy) lenses with you, the smaller size and lighter weight of a mirrorless camera may make up for the loss of certain features. For photo-intensive trips where it would be impossible to replace a lost or broken camera, such as an African safari, I pack two identical DSLR camera bodies, but on less exotic trips I sometimes take a chance and bring just one. Whatever camera you take on your trip, make sure you know how to use all its features and have tested it thoroughly before you leave, and if you’ve been using it for a while, have it cleaned in advance of your departure. Note that while I am a Nikon shooter, comparable gear is available from Canon for DSLR afficianadoes. In the high-end mirrorless arena, Sony’s Alpha a7R III and A9 are favored by many professionals and enthusiasts. My go-to camera is the Nikon D810. This is a professional model and not for beginners, but it really does do it all. The resolution is extraordinary, it performs superbly in very low-light situations, the autofocus is fast and flexible, its continuous burst shooting speed is good enough, and I love the feel of the camera in my hands and the control it offers over all settings quickly. I’ve put this baby through hell and high water, but it always comes through for me. I own two identical D810 bodies and bring both on most trips and to many local shoots, as well. A telephoto zoom lens is a must-have for most travel photographers, as it allows you to shoot many wildlife subjects as well as emphasize details in all subjects you encounter. A longer lens also can be used to provide a compressed perspective that makes far-away subjects appear to be closer to foreground subjects; this perspective can be very powerful in landscape images. My primary tele zoom is the Nikon 70-300mm f/4.5-5.6 VR lens. 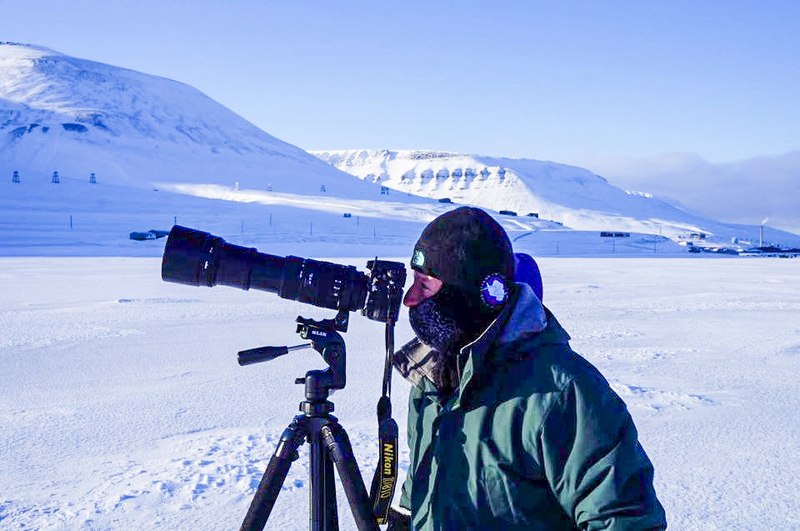 While this lens is built on aging technology and doesn’t always feel as solid as more professional lenses, it is relatively small and lightweight, fairly inexpensive, and provides a very effective vibration reduction function. This lens has been a staple in my bag for many years, during which time I’ve used it to capture many of my favorite images. Whatever flash you use, it is best to attach a diffuser of some sort to soften the otherwise very harsh light of the flash. And use a cable or a wireless trigger so that you can get your flash unit off the camera’s hot shoe; doing so allows you much more creative control over the lighting of your subject and also avoids the “red eye” effect in most cases. I also keep my camera set to lower the flash output by 1 stop, and I only override this setting occasionally. Flash is often best when used sparingly. Another essential is a good remote release for your camera. I know plenty of photographers who still use the good old trusty wired (or cable) releases. When reliability is essential, I reach for the cable release first. But often I want to be able to move away from the camera when shooting remotely, and in those situations I use a wireless release such as the RFN-4s Wireless Remote Shutter Release. Most of us would never consider leaving home without our phone, and there are additional good reasons to carry yours with you when you are photographing at home or around the globe. First, the cameras in today’s better phones are now good enough to make quite good images. I’ve been very impressed with the quality of the main camera, and even the selfie camera, on my old Apple iPhone 6S. But your phone is also an essential photography tool because there are some very good apps to help you plan, shoot, and share your images. There are too many to list here, but I’ll plan a future post to share some of my favorites. For post-processing my images, I use both Adobe Lightroom and Adobe Photoshop. I can do 90% of my processing using just Lightroom, but occasionally I do need the added power of Photoshop. While for many years I used the perpetual license software versions, by now I and nearly all photographers have gone over to the monthly licensing structure that Adobe calls the Creative Cloud.